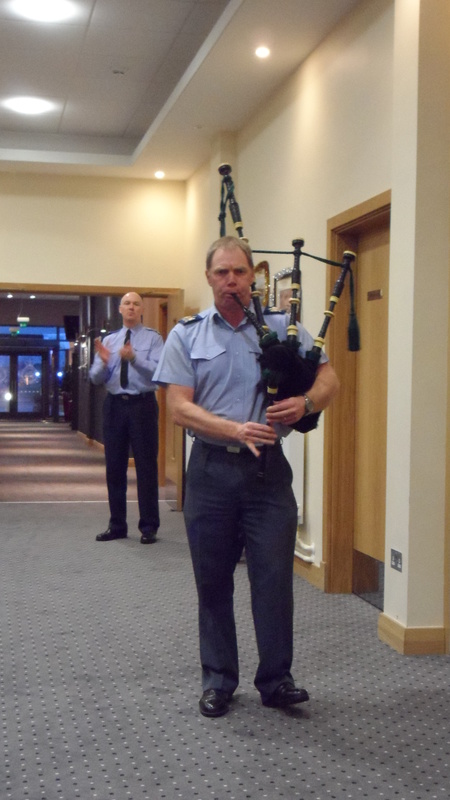 On the 12 December 2013 residents and staff had the privilege of being invited to a wonder afternoon at the Warrant Officer and Sergeant’s & Mess at RAF Lossiemouth. They were greeted on arrival and escorted to the Sergeant’s Mess lounge for some pre-lunch aperitifs! 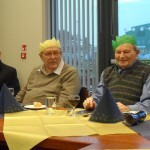 A lovely 3-course lunch followed with after dinner coffee and mince pies. We were kept entertained with a piper playing in the background who when asked played a request from a very grateful resident. 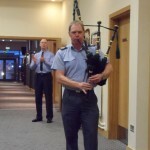 Special thanks again must go to RAF Lossiemouth for their care and attention throughout the day. 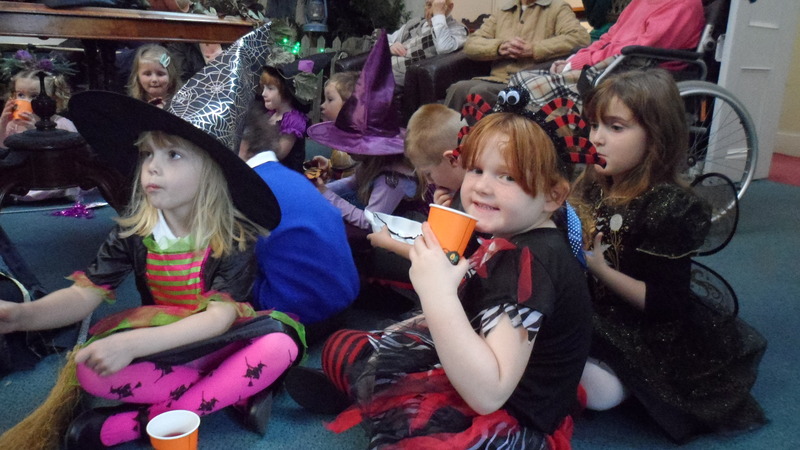 On Wednesday 30 October the residents and staff welcomed primary 1 pupils from East End School who came all dressed up for Halloween. The residents and pupils enjoyed Tommy Horne and his birds of prey whilst admiring the beautifully decorated ‘spooky’ hall; thank you Joan! 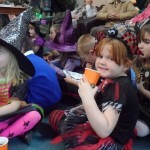 Everyone enjoyed some light refreshments and specially made Halloween cupcakes. The clock had been brought home the previous afternoon by the restorers so that it could rest in position and become acclimatised to it’s old familiar surroundings again before the event. Following delivery, the restorers did the necessary and soon the clock was ticking away contentedly and striking it’s chime every hour. How wonderful to have the clock which had been here since 1832 working again and as for it’s old body, well, not a crack or blemish anywhere to be seen – better than new because now it can boast character! The ceremony which marked the clock’s return was simple but meaningful. The Home Manager, Catherine Markey, thanked Kevin and Sheila West of Laich of Moray Clocks for their wonderful job in restoring the clock’s mechanism. She then thanked Alan and Paulina of The Curiousity Shoppe, Portsoy, for the amazing restoration of the woodwork and brass fittings. Mr Laurie Stewart, son and family representative of the late Alison Stewart was thanked for the donation which funded the clock restoration project. Mr Stewart unveiled the restored clock and accompanying brass plaque in memory of his mother. Rev. Graham Swanson, one of Anderson’s Board of Governors, spoke a short fitting address. He gave thanks for everything that has contributed towards making Anderson’s what it is. We remembered those that have served in, and been served by, Anderson’s in the past and a blessing was sought for the present and future of Anderson’s. 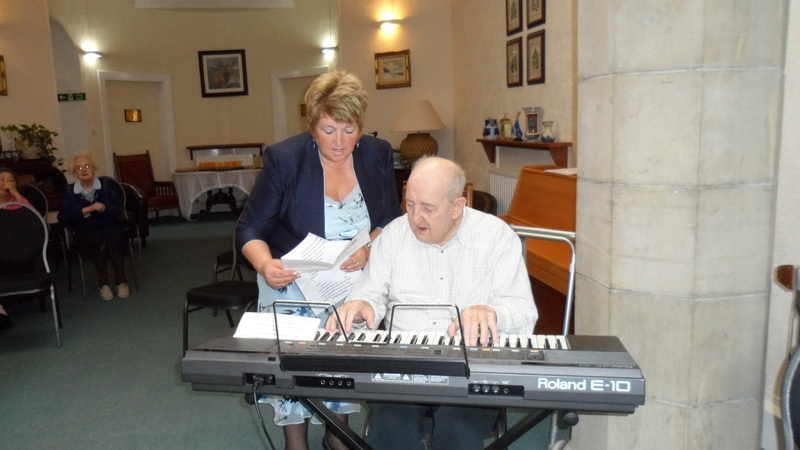 The resident’s were joined by staff and invited guests as they sang “Bless This House”. 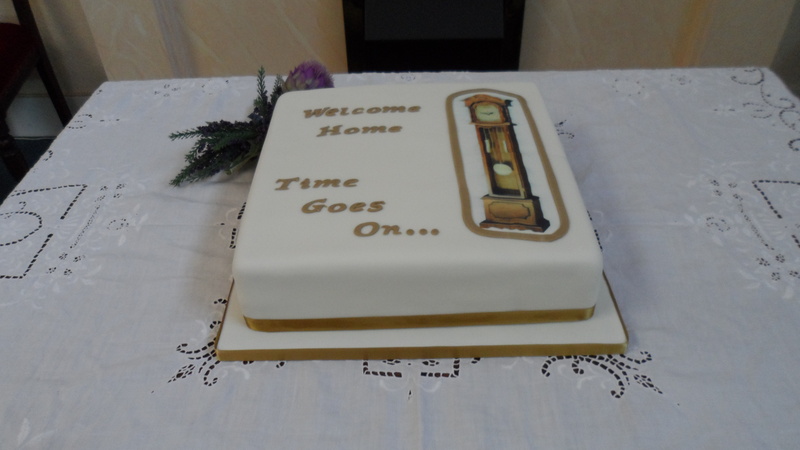 Yet another masterpiece cake had been created especially for the event by Lorna Robinson. 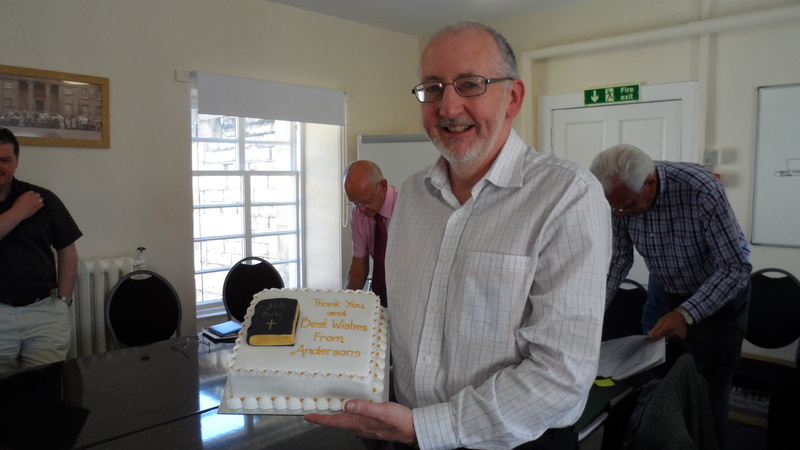 The celebration cake was cut by Mr Hugh Carter, Chairman of the Board of Governors of Anderson’s. Mr Carter gave a short, amusing speech which was much appreciated and finished the formal proceedings nicely. Our catering team, led by Anita O’Neil, had prepared stunning canopies and flutes of sparkly drinks for staff to serve to everyone. Judging by the many compliments received – the old grandfather clock had an excellent homecoming! Anderson’s held a Sport’s Week from 29 July to 2 August 2013. Traditional races such as the egg and spoon and the sack race were very hotly contested as staff took part in fancy dress. 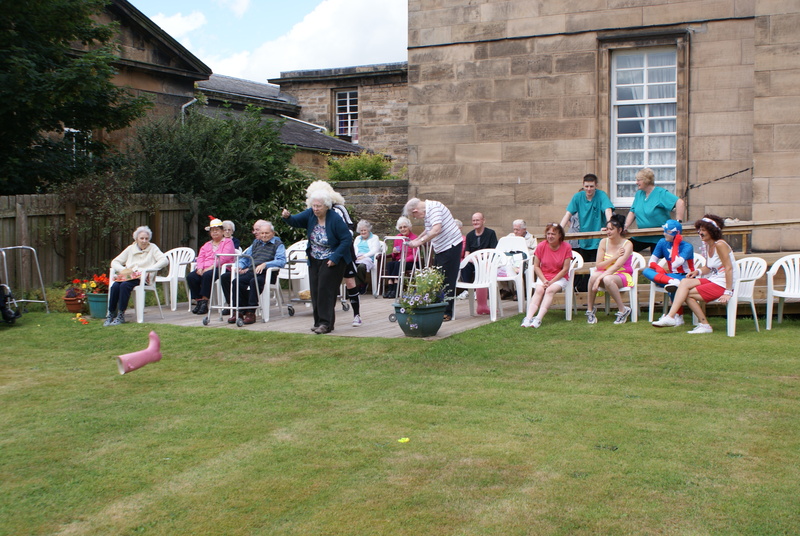 Resident’s enjoyed competing with indoor activities including Carpet Bowls, Hoopla, and Croquet to name but a few and also enjoyed an outside ‘Toss the Wellie’ competition. On 2 August we had our awards presentation with staff and residents being presented with awards and certificates. Overall champions were the Morrice Unit who were presented with the Seaforth Shield by our Home Manager, Catherine Markey. It has been a privilege to have had Colin on the Board of Governors. By his profession as a Minister of The Free Church of Scotland he cares deeply about people and this has been apparent in his role as Governor, both for staff and residents, and those in the wider community. He thinks logically and has brought a great deal of common sense, dry humour and thoughtfulness when serving as a Governor and as a member of the Finance Committee over the past 10 years during which time many changes have taken place. When a Governor retires it is customary for the Board to have tea and cake to mark the occasion. Colin was delighted with the cake made specially for him and requested that part of the cake should go to the residents of Easton House which was a lovely gesture. The Chairman thanked Colin on behalf of everyone at Anderson’s and wished him well for the future. 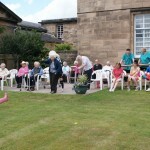 It was a gloriously sunny day as the residents made their way out into the Heritage Harden for our Summer Barbecue. They were met by a glass of fruit punch and enjoyed a selection of tasty meats including venison sausages, steak burgers and chicken kebabs accompanied by salad and coleslaw. 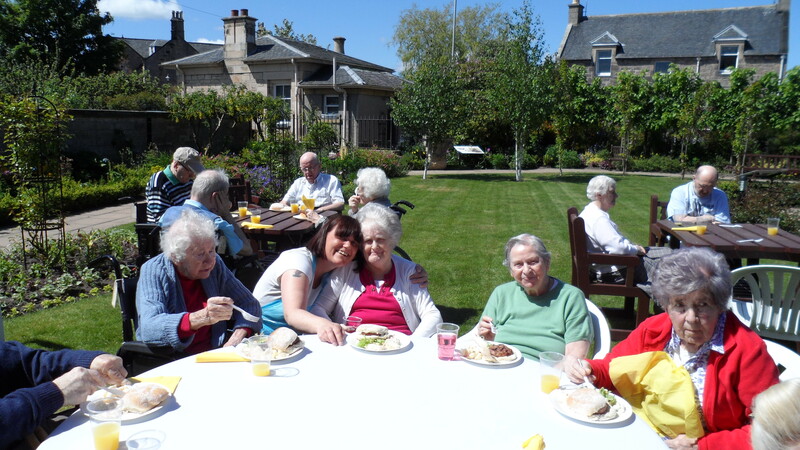 The staff and residents sat together and enjoyed the early summer weather. To finish off all were treated to a much needed selection of fresh fruit with ice-cream. The sun shone and a lovely afternoon was had by all. We received a progress report from Laichmoray Clocks last week along with several photos. Kevin West, proprietor of Laichmoray Clocks, informs us that the restoration is progressing well. He said that the movement and dial have been restored and are currently being “bench tested”. 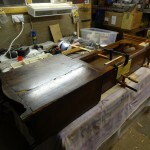 Repairs to the case are underway and cracks are currently being filled in with some missing woodwork having to be made. Staining and polishing will begin when Alan, the expert who is dealing with the cabinet restoration, is satisfied with the repairs. 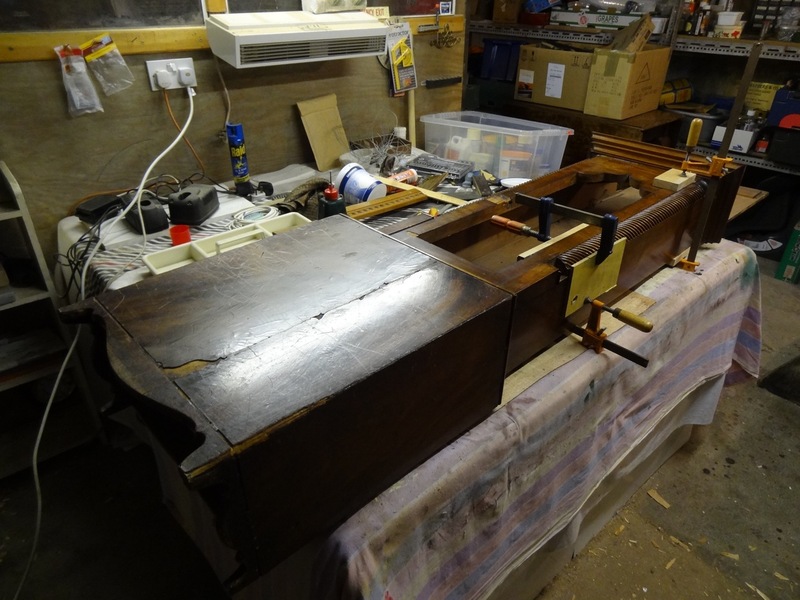 We’re unsure as to how well the photos will reproduce onto the website but a broad description is of a rather forlorn looking clock cabinet surrounded by clamps and tools – quite a busy scene really. It’s all happening! 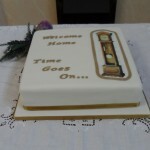 When we get word that the clock is ready, we’ll organise a homecoming celebration party. This will be a grand affair for residents and staff and something else to look forward to in our calendar of events at Anderson’s. This one’s for the history book. We could see how the introduction of an IT Suite at Anderson’s could benefit staff with their learning but some folk may have been a ‘wee’ bit sceptical as to how the residents could benefit from something that was, after all, quite alien to them. We have several residents who not only regularly “surf the net” but also keep in touch with friends and family by email. 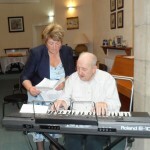 Residents look forward to their next lesson/session which enables them to voyage into a whole new world of discovery. “Skype” has proved invaluable as some residents communicate by sound and vision with loved ones overseas. I guess the moral of this story is that you are never too old to learn. Age and disability need not be a barrier to exploring and pursuing new activities. Thanks to Karren our activities co-ordinator for her inspiration and dedication to our IT students. I had the pleasure of attending the above event and took my mother along as a special treat. We were welcomed with open arms and before long were spoilt with hot tea and warm toast which was soon to be followed with a delightful evening meal. The atmosphere was lovely with tranquil music playing in the background. Joan Cowe, Anita O’Neil and all the behind the scenes staff did a fabulous job, keeping us topped up with fresh tea and light conversation. My mother had a wonderful evening and her leaving remark was “when can I move in, I have had a lovely evening”. She took a lovely presentation box with cakes and treats back to Glasgow the following day for the rest of my family to enjoy as although we tried we could not finish off the homebakes selection. Around £400 was raised for Anderson’s Hall Funds and I look forward to supporting this event again next year. The grandfather clock had been built by an Elgin clockmaker of considerable note and occupied a proud position in the main hall since Anderson’s opened it’s doors to needy people way back in 1832. The clock was still there but nobody could remember it working and it’s poor case was all bedraggled and broken – it was still a special part of Anderson’s though. It must have witnessed many thousands of people over the centuries go about their business in the grand hall. In March a local professional clock restorer visited Anderson’s – the clock was mentioned to him in passing. He took time to have a good look and his professional opinion was that the clock could be restored – at a price! One day, the written estimate for the restoration project came in the morning post. That very afternoon a generous donation from an appreciative benefactor was received which was to be used for the clock restoration. On Friday 5th April, a phone call was received to say that the clock was being picked up that morning around 11ish. Word spread round the units and soon after 10.30 a.m. residents began to gather in the hall to witness the event. Coffee was served and at 11 o’clock the proprietors of “Laichmoray Clocks” arrived. Kevin and Sheila West said hello to everyone and the Home Manager spoke about the history of the clock while Kevin of Laichmoray Clocks described the restoration plan. Everyone watched as the clock was slowly and carefully taken apart and the pieces wrapped very gently in cloths and put in a box before being carried out bit by bit. In the meantime the drinks trolley had been around and everyone had a drink to “toast” the clock on it’s journey. Wilma and the Craft Group in the corner started humming a tune and before long everyone was singing the old song “My Grandfather’s clock was too old for the shelf …” the spontaneous sing song seemed so appropriate and so much enjoyed, that residents requested it be sung again so it was. “Laichmoray Clocks” said that they would give progress reports along with pictures if possible to keep everyone in touch. They were hopeful that the clock could be ready for return in approximately 6 weeks time. Plans are already afoot for a welcome home party for the Grandfather Clock in the early summer. Residents’ singing group are practicing “My Grandfather’s Clock …” and the exercise class is practicing swaying like a pendulum.